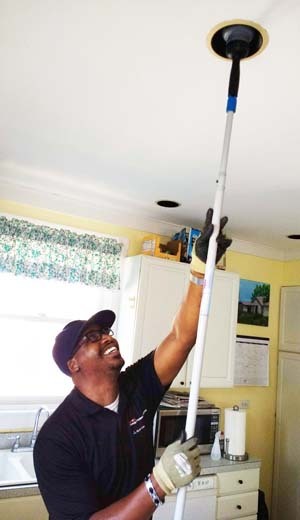 Sam Martin, an engineer with the Energy Efficiency Program, visits homes to replace all light bulbs with long-lasting, warm LED bulbs, at no charge. Call 888-652-2955. 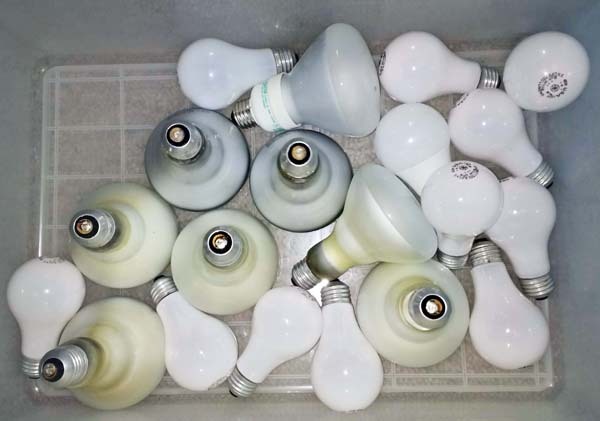 Commonwealth Edison, in collaboration with your gas company, offers an Energy Efficiency Program with lots of freebies, in addition to LED light bulbs. Just set up an appointment by calling 888-652-2955, as I did in August. The only investment on your part is about an hour of your time. Sam Martin, an engineer with the Energy Efficiency Program, came to our house bearing gifts on a warm day in August. It felt a little like Christmas in summer. We have been slow to move over to LED bulbs. I preferred the yellow light cast by incandescent bulbs and thought LED lights cast a cold, blue light. But Sam explained that all his bulbs are warm LED, not daylight LED. The daylight bulbs are the ones that cast bluish light. LED bulbs use up to 75 percent less energy than traditional incandescent bulbs, so just imagine the environmental impact if everyone switched from incandescent to LED. Sam has all the right tools to work efficiently; he typically finishes within an hour. Sam was only allowed to replace our incandescent bulbs, so if we already had an LED bulb in a lamp, then he had to skip past it. In the process of checking all our fixtures, he deftly repaired a ceiling fixture that had stopped working, and discovered that one of our older lamps takes 3-way bulbs. We had no idea. So now we have low, medium, and high light with the new, 3-way LED bulb he installed. Sam replaced 20 bulbs at our house but explained that we shouldn’t be too embarrassed. “Some of the houses on the North Shore need 300 new bulbs,” he said. There is no limit to how many bulbs he installs at each residence, but he thinks the average is about 40 per house. Sam also replaced our showerhead in order to conserve water and use less natural gas to heat the water heater. I can’t say everyone in my family is happy about having less water in the shower, but they’ll get used to it. The average shower lasts 8 minutes and uses about 18 gallons of water. We hope to save 2,800 gallons per year. Sam gave us an advanced power strip that automatically shuts off power when appliances or electronics are idle. Installation was not included on this freebie. Other products that we didn’t take advantage of are faucet aerators for bathrooms and kitchens (our faucets had the wrong opening), hot water pipe insulation (not necessary here), and smart thermostats, which are not free but heavily discounted. Ecobee smart thermostats set a timer to raise and lower the thermostat so that central heating and cooling adjusts when you sleep or are away from home. Apparently, these work better with central air and heat instead of our old-fashioned radiators with boiler. Every citizen who buys electricity from ComEd actually winds up paying for the Energy Efficiency Program, a government mandated program, as a part of their regular electric bill. It turns out, we’ve all been paying for this program all along. It feels good to get what we’ve already paid for and to know that we are reducing our environmental impact while saving money. So that hour investment of time will help us save 900 kw hours of electricity and 2800 gallons of water per year. Not bad!